After purchasing a new Macintosh II, Thomas rewrote the Display code to work in colour. A number of capabilities were also added to the program, including the ability to read and write various file formats, a number of image processing routines that we now know as filter plug-ins, and the option to adjust levels – colour balance, hue and saturation. ‘Display’ became ‘Photoshop’ in 1988. This same year, John appealed to Silicon Valley bigwigs including engineers at Apple and Adobe. While Adobe was interested, an agreement couldn’t be settled on, and eventually a short-term deal was agreed with scanner manufacturer Barneyscan. And so, the first public offering of Photoshop was in fact called ‘Barneyscan XP’ - approximately 200 copies of Version 0.87 of the program were shipped with scanners. After a further demonstration for Russell Brown, art director at Adobe, the company purchased the license to distribute the program in September 1988. So, while John created and fine-tuned plug-ins in California, Thomas continued writing code from his home in Ann Arbor, Michigan. 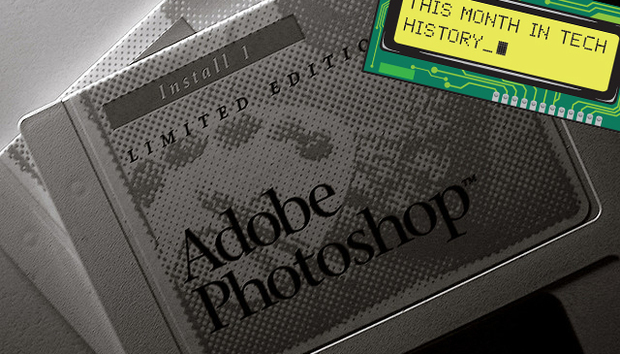 Photoshop 1.0 was released on 19 February 1990 exclusively for Macintosh. Twenty-five years later, and Photoshop is on version CC 2014.2.2 (released December 2014). The program name has become a verb, with regular public outcry over the 'celebrity photoshopping’ disasters, it’s become the de facto industry standard in raster graphics editing, and is one of a whole suite of Photoshop products - Photoshop Elements, Photoshop Lightroom, Photoshop Express and Photoshop Touch – collectively known as “The Adobe Photoshop Family”.